Write a C++ program to print even numbers between 1 to 100. 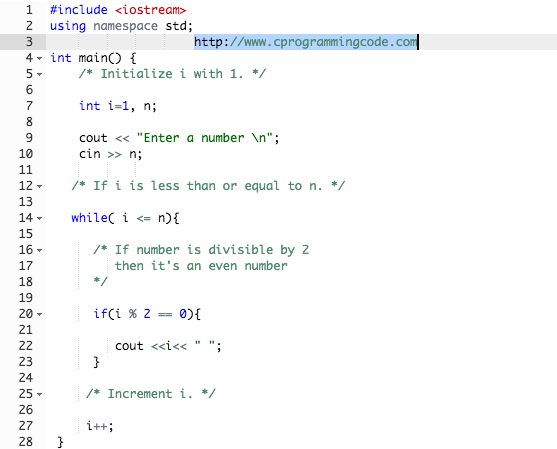 Write a C++ program to print even numbers between 1 to N.
In this tutorial, we are going to write a c++ code which print even numbers between 1 to 100 using for and while loop. 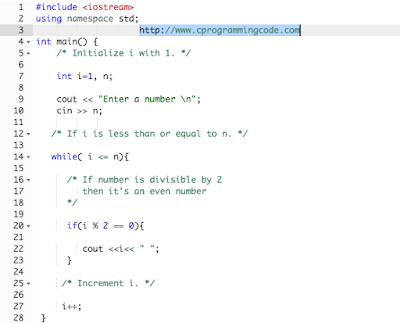 In above examples, we have written a code to print even numbers between 1 to 100 using for and while loop. In this example, instead of 100 we take a input value from user and print even numbers between 1 to n (where n is input by user).